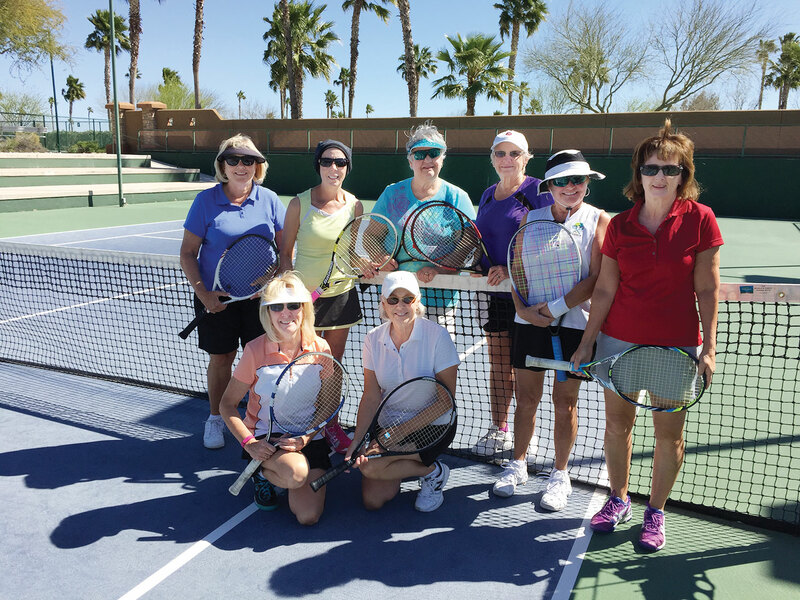 The third session of the Desert Cactus Tennis League got underway in January 2015. Teams from Provence in Maricopa, Sun City Anthem at Merrill Ranch in Florence and Mission Royale in Casa Grande joined with Robson Ranch in Eloy once again for some exciting, competitive tennis matches. Each match consists of two sets with a third set Koman tie-breaker; points are accumulated each week. The captain of the men’s doubles team for Robson is Rami Mayron; for the women’s team, The Racquet Rebels, Linda Gayer. Mixed Doubles, Robson Windmills, is captained by Barb Sewell. The League sponsored a Women’s Tennis Scramble hosted by Robson Ranch. Players from the teams in the league invited some other women to introduce them to the Desert Cactus League. It turned out to be one of the warmest days this winter! A warm, sunny 81 degrees! Forming two teams, six players were on the blue team, coached by Rhoda Zaph from Mission Royale; six were on the red team, coached by Orly Mayron from Robson Ranch. The format: each of the three partners on the team played all the other team’s partners, accumulating set scores along the way. At the end of the afternoon the red team beat the blue team by a score of 57-56! Everyone had a great time meeting some new players, playing close matches and forming new friends!